Having healthy self-esteem helps you navigate through life with the confidence you need to achieve your goals. The more confident you are, the more successful you will be since you are more likely to persist in the face of difficulties. People with high self-esteem have confidence in their ability to cope with the problems that arise in their personal or professional lives. 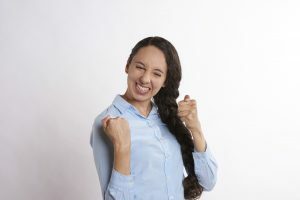 With a confident, assertive attitude, it is easier to believe that you can successfully manage the challenges in life without a great deal of stress and anxiety. 1. Avoid perfectionism in yourself and others. Recognize that no one is perfect. Identify your areas of strength and competency and work to improve your skills rather than addressing your weaknesses. Define realistic, achievable goals. 2. Put behaviour in perspective. Don’t beat yourself up if you make a mistake and stop over-focusing on what went wrong. Instead write an account of what went right and what you could change next time to ensure a more successful outcome. 3. Stop worrying about what others think. Looking for validation from others can make you feel vulnerable. If we constantly look towards others for validation we can end up with little control over how we feel. Our self- worth becomes dependent on others’ opinion. Learn to accept and recognize your strengths and shortcomings. Learn self-validation. 4. Stop destructive thoughts by taking control of your inner critic and developing more compassion towards yourself. If your negative voice is telling you how ineffective you are, replace the negative thoughts with realistic statements such as “ there have been many times I have worked hard to achieve my goals.” Negative thoughts can lower your self-esteem. 5. Self- affirm by giving yourself positive messages. 6. Let negative people go. Eat a healthy diet, get enough sleep and exercise regularly. Developing a support network is essential to good self-care. It is important to have people on whom you can lean during difficult periods. When you care for yourself you communicate to yourself and others that you are worthy of care. Agathangelou, Fay. December 30, 2014. How To Stop Worrying About What Others Think. Healthy Place. Bilanich, Bud. August 27, 2013, The Importance Of Surrounding Yourself With Positive People. Jennings Wire – The World of Success. Burns, David D. October 22, 2013. Secrets of Self-Esteem, Part 1. FeelingGood.com. https://feelinggood.com/category/secrets-of-self-esteem/. Accessed July 22, 2017. Firestone, L. (2016, April 11). How to Tame Your Inner Critic. Retrieved October 26, 2017, from Psychology Today.